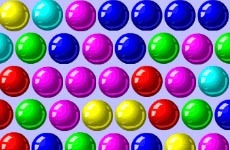 Fling the colored blocks at the same colored blocks to clear the level. Click on the block to the left and pull back to see where it will fly, then let go to fling it to the blocks on the right. Any block it touches that is the same color will clear. Bonus points are awarded if you can clear all the blocks from a level.